British Airways and Asiana Credit Cards, Worth the Hassle? I already have the SPG AMEX, which I think is the best travel credit card out there. You get 1 point/$1 for everyday purchases. You get an additional 2 points/$1 for stays at SPG properties (W, Westin, Sheraton, Le Meridian, Four Points and more). If you are Gold or Platinum SPG member, you get 3 points/$1 instead of 2 points for stays at SPG properties. You can earn Gold status at SPG by spending $30,000 on the card in a calendar year. A SPG night redemption runs around 10,000 points for a decent property. So that’s about a $200 return for $10,000 spent on the card. Not only that, the SPG AMEX allows you to transfer points to airlines miles at a 1:1 point to mile ratio, with a 5000 miles bonus for every 20,000 points transferred to miles. So if you transfer 20,000 points to an airline mileage account, you would get 25,000 miles, usually good for a free domestic flight. The card has an annual fee of $45 that is far less than the annual fees of airline cards, which run about $75-$100. Lastly, I think SPG is the best hotel program out there and hotel points are far better than airline miles. However, there have been 2 recent airline card offers that have been tempting, but not sure if its worth the hassle. Firstly, the British Airways Visa Signature Card. What’s so special about this card? Well not much but the current promotion is probably the best signup promotion I’ve seen yet. You get 50,000 miles for your first purchase on the card and then another 50,000 miles if you spend $2000 in first 3 months, which is easily doable. That’s a total of 100,000 miles, which gets you 2 free transatlantic flights from the US to Western Europe in economy. You also get a free companion voucher valid for 2 years for spending $30,000 on the card in a calendar year. The downside of the card? First, the annual fee is $75. Also, personally I don’t ever fly British Airways and I don’t fly any of the airlines in One World, which includes American Airlines. Star Alliance is probably the best airlines alliance out there especially now that Continental has defected over to them from Sky Team. This redemption policy also allows you to redeem a one-way ticket instead being forced to redeem a roundtrip. Additionally, another great thing about Asiana is their favorable status qualification. See my previous post about this. Basically you just need 40,000 miles in 2 years to get Star Alliance Gold (Asiana Diamond). 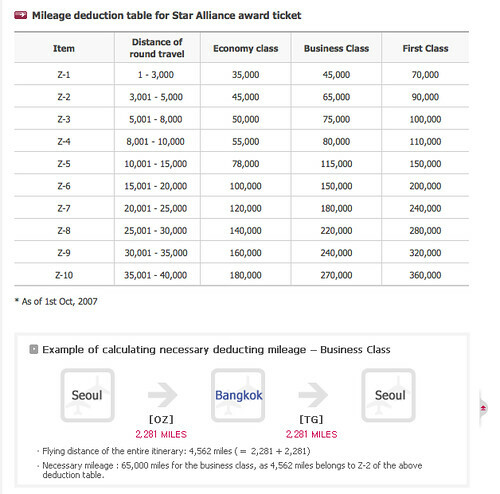 This doesn’t have to be on Asiana but you can use any miles flown on Star Alliance partners for status qualification. In contrast, you need to fly 50,000 miles with United in one calendar year to get Star Alliance Gold (United Premier Executive). Recently, after hitting 1K with United, I’ve been banking all my United miles to my Asiana account. So what’s the verdict? If you are willing to deal with getting the BA Visa and then canceling after 3 months, the $75 annual fee is definitely worth the 2 round trip tickets to Western Europe. If you fly Star Alliance frequently, especially to Asia, and don’t have any other credit cards with an annual fee, then I think making the Asiana AMEX your primary credit card is a great deal. If none of these sound appealing enough, do look at the SPG AMEX. Not sure if the BA card is worth it for americans. Starwood AMEX is better. Really enjoy your analysis & comparison thought. Write more! great analysis. i don’t think it’s worth it unless you live in s korea or the uk. Thank you for any other informative website. The place else may I am getting that type of info written in such an ideal way? I have a venture that I’m just now working on, and I have been on the look out for such information. Darius,You might also consider the Fidelity AMEX for eryveday spend, if you ever finish-off all your required spending. You get 2x points on everything, which you can transfer to Aeroplan 1:1, under a little-known provision. So, for $45K in spend, you get one biz class to Europe.For $90K in spend on Fidelity AMEX, you get two biz class to Europe, starting at zero. As you pointed out, it would take $120K in spend on Chase BA card to do the same, plus $1,200+ in fees for two (that you could have just used that $1,200+ to purchase enough Dividend Miles ($1,478 worth) to get you there with zero spend). It would take $145K in spend on SPG AMEX starting from zero (140K becomes 175K Aeroplan with 25% bonus, plus 5K more equals the 180K Aeroplan miles you need for 2 biz class).This beats the Asiana AMEX that Gary mentioned in the first post, if you live on the West Coast (or basically anything west of Chicago), since you don’t have the 10K mile roundtrip limit to contend with. If you live on the East Coast, the $40K spend on Asiana AMEX for one biz class, is lower than the $45K spend on Fidelity AMEX.However, there is no annual fee on Fidelity AMEX, versus a $99/year fee on the Asiana AMEX. So even if you do live on the East Coast, the Fidelity AMEX is superior, if it takes you more than three years to spend the $40K on the Asiana AMEX and to use the points. You would have been better off just spending the same $40K on the Fidelity AMEX, and buying the rest (like from Membership Rewards) for $250, and save $297 in annual fees.